Albert John DeRogatis was born May 5, 1927 in Newark. Quick and powerful, Al grew to 6’4” during his football career at Newark’s Central High, garnering All-State honors and distinguishing himself as one of the most sought-after prep linemen in the country. He accepted a scholarship from Duke University, where he excelled as a center during his sophomore. A knee injury as a junior prompted a switch to tackle the following year and he earned All-America status at that position in 1948. 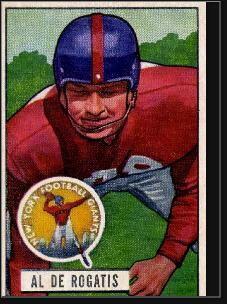 The New York Giants took Al in the second round of the 1949 NFL draft and installed him at defensive tackle. He lined up between Ray Krouse and Ray Poole on the right side and was equally good at rushing the passer or stopping the run. Arnie Weinmeister played defensive tackle on the left side. Al’s is work on the team’s defensive line created the foundation for the great New York team of the 1950s. Unfortunately, Al was not around for the glory of that era. After earning All-Pro status in 1950 and 1951, he reinjured his knee in 1952 and quit football in 1953 to pursue a career in the insurance industry. He also did a little scouting for the Giants on the side. Al left the booth in 1977. He was later inducted into the College Football Hall of Fame. He lost a battle with cancer and passed away in 1995 at the age of 68.